Samsung India has announced the launch of its new interactive display, the Samsung Flip aimed at B2B customers. Priced at Rs 3,00,000, the Flip comes with a 55-inch display with 4K UHD resolution. The device is powered by Tizen Processor with an 8 GB network storage. 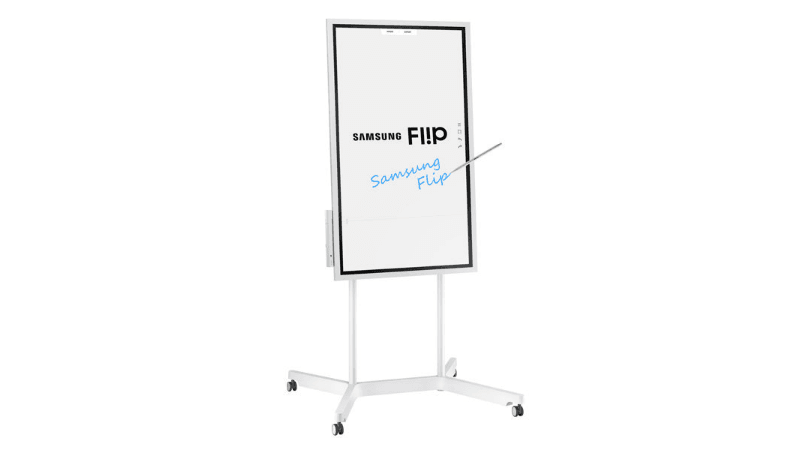 The Flip can aid professionals and business organisations in conducting meetings or discussions according to the Samsung, which stated the same in a statement. Samsung said the Flip platform enables meetings to take place anywhere and anytime. Unlike traditional boards, it doesn’t need dedicated touch pen to interact with the screen, and a note can be erased through a quick palm swipe. A user can access up to 20 pages of writing space with support for search functionalities available to instantly guide participants to specific content. “We are excited to launch the ‘Samsung Flip’ in India, and we look forward to building upon this technology to help businesses work better, smarter and quicker,” said Puneet Sethi, Vice President, Consumer Electronics Enterprise Business, Samsung India. The Samsung Flip display is customisable and can configure to be used in both landscape (3840×2160 pixels) or portrait mode (2160×3840) orientations as per meeting needs. Since it is portable, it can easily be connected to a wall mount for roundtable discussions. The Samsung Flip also supports simultaneous multi-users support. Samsung said that it lets up to four different participants to introduce content or annotate directly on screen at the same time. As for security, the Samsung Flip display stores all content within a central database, eliminating security risks. An airtight, password-based protection system aims to safeguard the meeting details and ensures only the approved users can access the information. Once logged in, meeting facilitators and participants can download and share featured content with traditional e-mail or printing. In addition, users have the option to save meeting details on a USB drive or other external sources. Samsung first unveiled the Flip in January this year at Consumer Electronics Show. The digital whiteboard measures 1302.6 x 805.5 x 52.0mm and weighs 28.9 kg. It is priced at Rs 3,00,000 and comes in Light Gray colour option only.